In the archipelago south of Fyn (“the South-Sea Islands” of Denmark) lies a tiny, flat sliver of land, shaped like a birch leaf and known as Birkholm (Birch Island). Whether it got its name from its form or from the presence of birch trees I do not know. 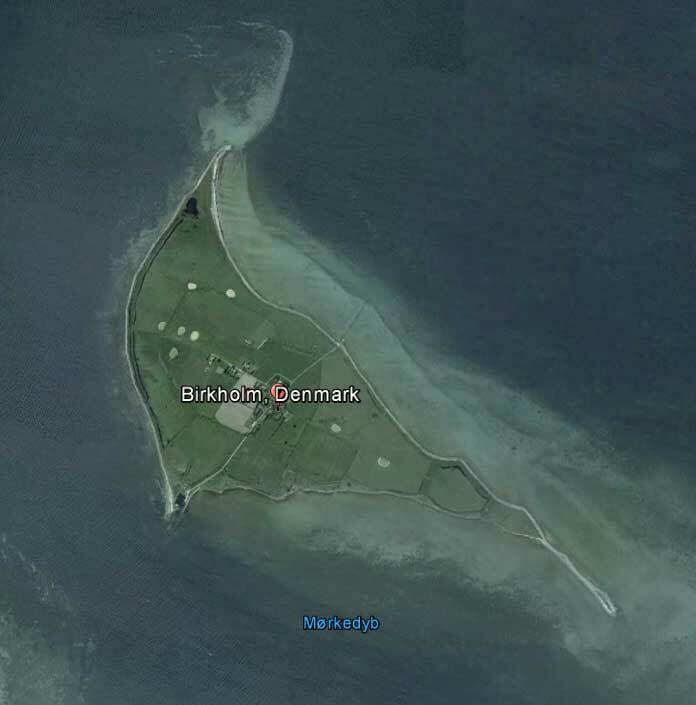 Most Danish place names go back thousands of years. During the Middle Ages it was a royal game preserve. The area of the island is .96 sq. km. It has traditionally contained two farms, and in 1929 its population was 68. With the general decline in agriculture and growing mechanization the farms closed in the early seventies and the number of year-round inhabitants decreased until in 1995 only two fishermen, a dog, some hens and a 29 year old Jersey cow (the oldest cow in Denmark) were left. When I flew over the island in 1980 I counted 14 buildings at its center, and spotted a road leading from the settlement to a wharf at its shoreline. It is one of the smallest of Denmark’s inhabited bits and pieces. In 1872 a storm produced a tidal wave which completely submerged this bagatelle, as well as doing great damage to other parts of the country. Two years later a fire destroyed most of the buildings and reconstruction took place. A boy growing up in the 1700s would not need a surname as long as he stayed in the parish where he had been born; his given name plus his father’s name with “-sen” added would be sufficient identification. When he moved away or visited nearby ports the name of his home community might be added. Eight km. south and southwest of Birkholm, on the island of Ærø, lie the little towns of Marstal and Ærøskøbing. In the census records of 1803 there is mention of a fifty year old skipper by the name of “Jørgen Jørgensen fra Birkholm”, living in Ærøskøbing. His wife was Anna Thomsen Piil, baptised in 1760. In the next generation the “fra” (“from”) was dropped and their son was known as Christen Albertsen Birkholm. C.A. 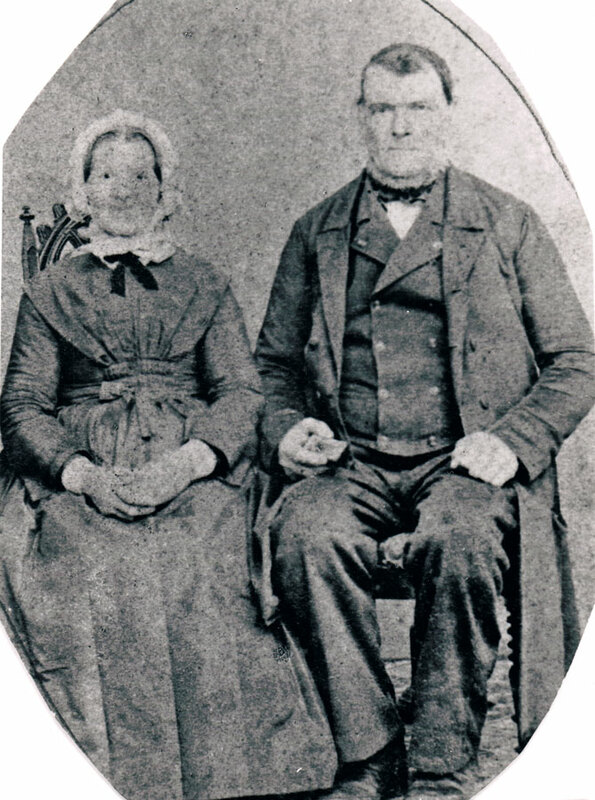 Birkholm (1799-1869) was my great-great-grandfather (tipoldefar). He lived in Marstal and was a sailmaker. His wife was Cecilie Kirstine Hansen (1805-88). The surname is uncommon, but there were Birkholms on Ærø as early as 1620. Apparently Ærø was a common destination for young people leaving the smaller island for a more productive and exciting life in the wider world. C.A. 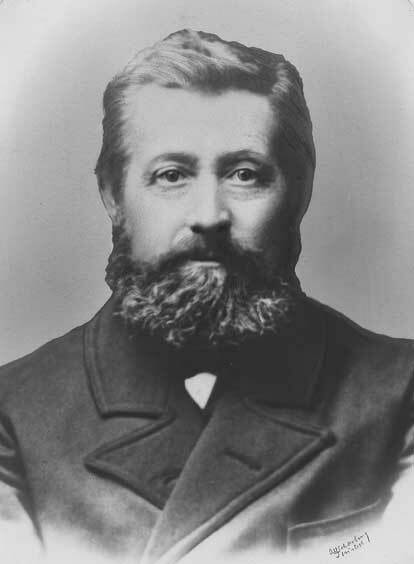 Birkholm and his wife had nine children. Of these Jørgen Jørgensen Birkholm (1829-1932) was a seacaptain and lived to be almost 103. According to the records his children were baptised in Ærøskøbing, so he and his wife must have lived there for a number of years; however he spent his last years in Fåborg. When I was in Fåborg in 1980 I visited an elderly lady who remembered him. He would wash his feet in the back yard in February rather than make a mess in the house; he was tough, she said. “Gamle Onkel Jørgen”, as Mother called him, was in his old age the last remaining veteran of the war of 1848-50 against Prussia. He had been decorated after the war, and at his funeral King Christian X, the Navy Ministry and the Naval Veterans Association were represented. Two of his sisters, Christiane Cecilie (b. 1834) and Cecilie Christine (b. 1839), lived to be 97 and 98, and continued to do their housework themselves while in their nineties. The three lived together in Fåborg in their old age. My great-grandfather was their younger brother. Like his father, his name was Christen Albertsen Birkholm; he was born in 1841 and was known as Albert. He also followed the sea, and in his youth visited lands around the world. He fought in the war of 1864-66, against Prussia. In 1866 he obtained his skipper’s papers and from then on sailed his own ship, the “Anne Maria”, hauling freight among the Baltic ports. Albert was married in 1867. His wife was Christiane Louise Berentsen and was known in the family as Jane (pronounced “Yane”, with the E sounded – as E in “get”). 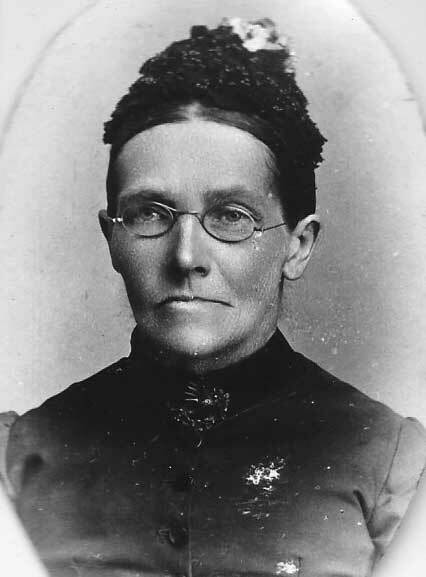 She was born in Fåborg in 1841, the daughter of Ludvig Bernt Berentsen and Birthe Marie Nielsdatter. 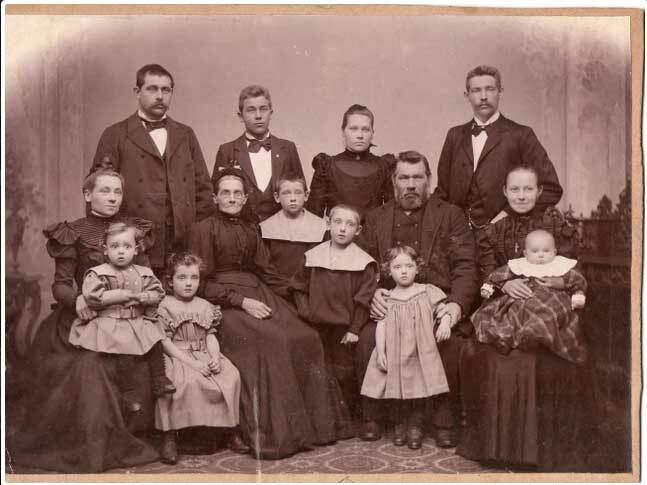 Ludvig Berentsen was a shoemaker and the family came from Flensborg, just south of the present German border. Jane apparently spoke German in addition to Danish. Albert drank more than was good either for himself or for his wife and family. As long as he was on the sea he abstained and was popular with his crew. But whenever he was at home in Fåborg alcohol took control, and his wife often spent the evening in the mission house (The Home Mission of the Lutheran Church), returning home when she was sure her husband was in bed and asleep. His drinking seems to have had little effect on his children except perhaps to direct some of them to their mother’s position of abstinence. They were both mild, kindly people, and grandfather apparently had memories of a happy and eventful childhood. Albert and Jane owned a house and garden in Fåborg. They celebrated their golden wedding anniversary in 1917, and Albert died soon afterward. My father knew Fru Birkholm when he was in Fåborg, and he and Mother attended her funeral there in December 1923. Of their children only the oldest, Chrejsten, remained in Fåborg. 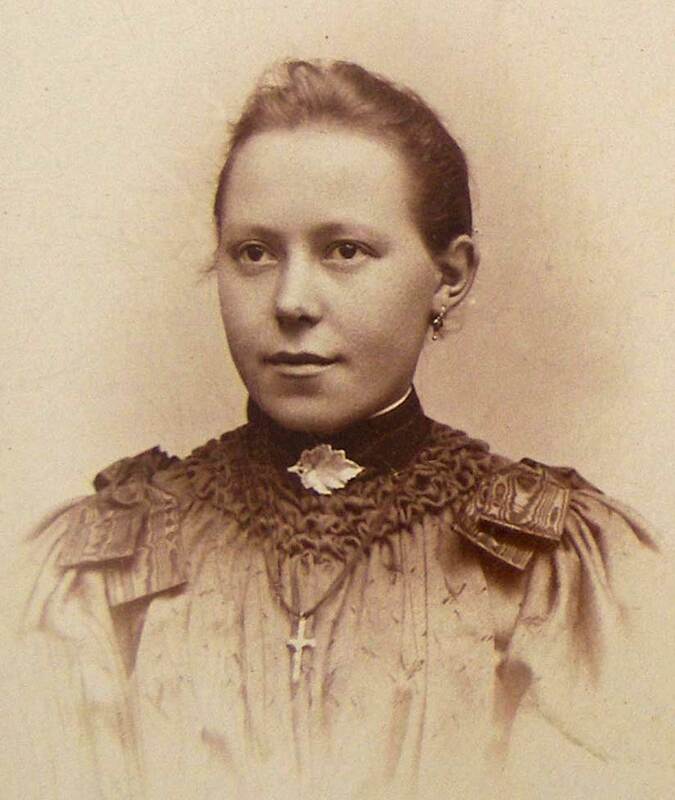 Ludvig spent most of his life as a customs officer in Arhus; he married his cousin, Jane’s niece, Sofie Johansen; Sofie had a glass eye which was a subject of wonder and merriment for the family. 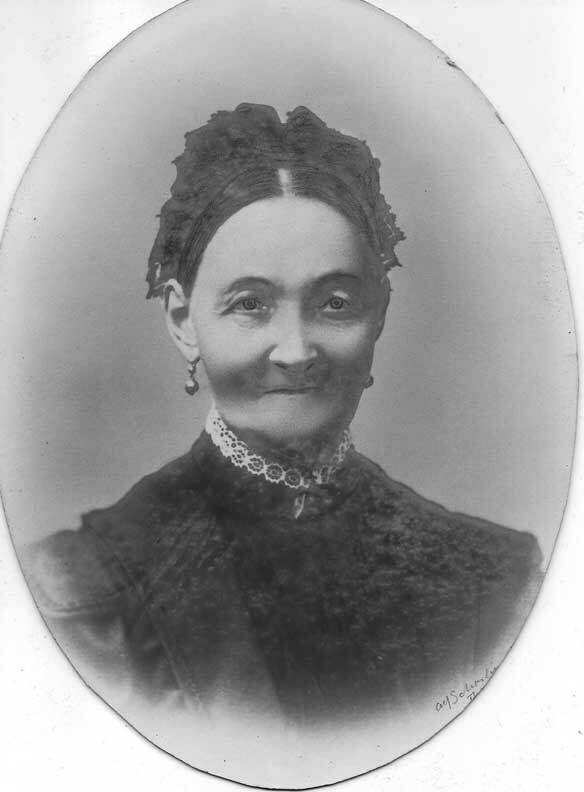 The oldest daughter, Cecilie, married Sofie’s brother, Johan Johansen; Onkel Johan opened a glazier’s shop in Thisted and built up a sizeable business. Marie never married; she became head nurse in the Thisted hospital. Jørgen served an apprenticeship with Johan and eventually also prospered as a glazier in Thisted; under his sons the business failed due to alcohol abuse. Christian was my grandfather. Katrine married a postman in Odense and is said to have been a beautiful singer. 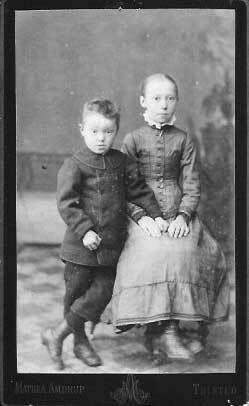 The Birkholms were clever, intelligent, talented, humorous, adventuresome and interested in every aspect of life. But the family has also had its share of alcoholism, depression, tuberculosis and asthma. I have come across another Birkholm family, also with origins in “the South Sea Islands”. At least one member of each of the two families earned his living through artistic pursuits and was an alcoholic. In each family there was tuberculosis, idealism and an interest in socialism. It seems reasonable to suspect a connection between the two. But where is that connection? 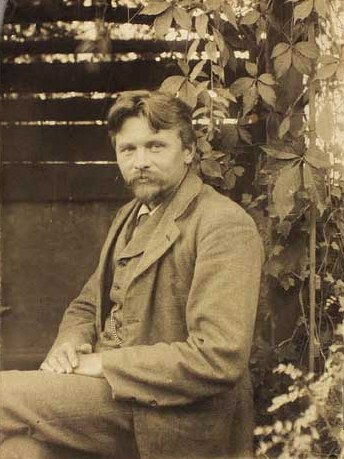 Jens Birkholm (1869-1915) was born and died in Fåborg. He was known as The Poverty Artist. He was eight years older than my grandfather, and as Fåborg is a small town they may have known each other in their youth. Jens’ father was a seacaptain, Christen Jensen Birkholm. His grandfather was Jens Hansen Birkholm, and his great-grandfather was Hans Jensen Birkholm who died in 1811, somewhere in Drejø Parish, of which the ancestral island forms a part. Jens was drawn to portrait and landscape painting. He studied in Copenhagen and in Germany, and was influenced by the German Marxists. In 1900 he returned to Fåborg where he remained until his death in 1915 from tuberculosis and alcoholism. One morning he was found dead on his doorstep; he had been drinking heavily during the night and had not managed to make it to bed. 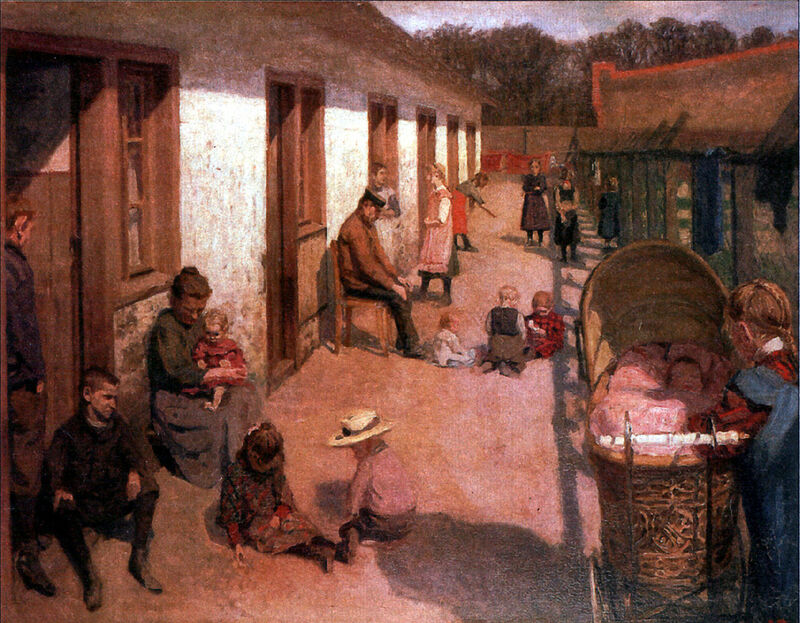 Residents of the poorhouse, Charlottenburg, 1910 by Jens Birkholm. In spite of his studies Jens has been described as largely self-taught. 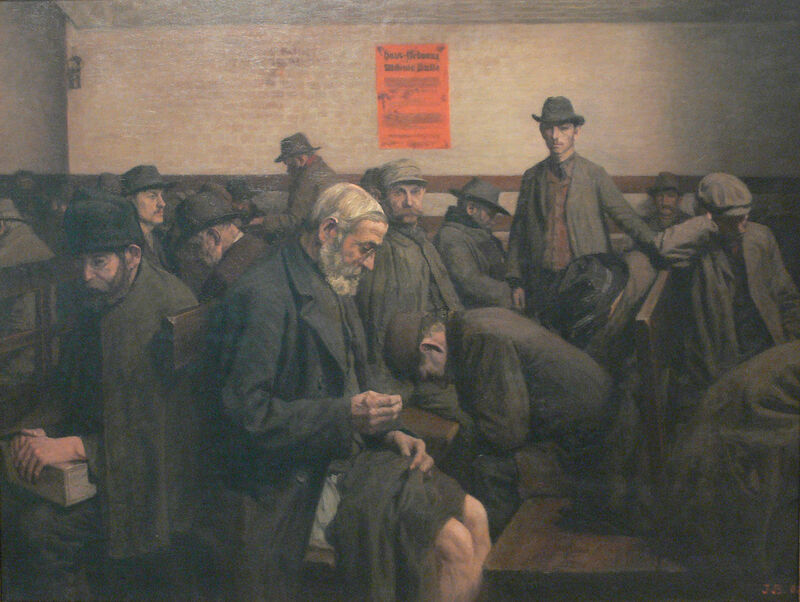 He belonged to the “Armeleute” (German for “poor people”) school of artists and his sympathy for the poverty- stricken was evident in his paintings. I saw 17 of his works in the Fåborg Museum and in Odense, and I have never seen poverty, misery and hopelessness portrayed more poignantly anywhere. A number of his works portray life in the Fåborg orphanage (where his aunt was superintendent) and in the poorhouse. His concern for the disadvantaged was apparently at the root of his political allegiance. He was continually on the verge of becoming a writer and a politician, but never quite crossed the line. One of his friends was Jeppe Aakjær, who delighted Denmark with his songs of the ordinary folk – a Danish Robert Burns. Another friend was Martin Andersen Nexø, a novelist who wrote of the lives of the common people; among them Pelle Erobreren (“Pelle the Conqueror”- much later made into a film, with English subtitles). Andersen Nexø has been described as Denmark’s second best known author – after Hans Christian Andersen. Jens Birkholm lived in poverty, and many of his paintings were ruined by water when his roof leaked. He never married. Family tradition suggests that there was a connection between the two Birkholm families, but if so it must have been very distant for I have been unable to find it. My Birkholm ancestors used to speak of Jens as Grandfather’s cousin. But the Birkholms were given to hilarity and the reference was probably made in jest. My mother’s mother was Karen Povlsen. 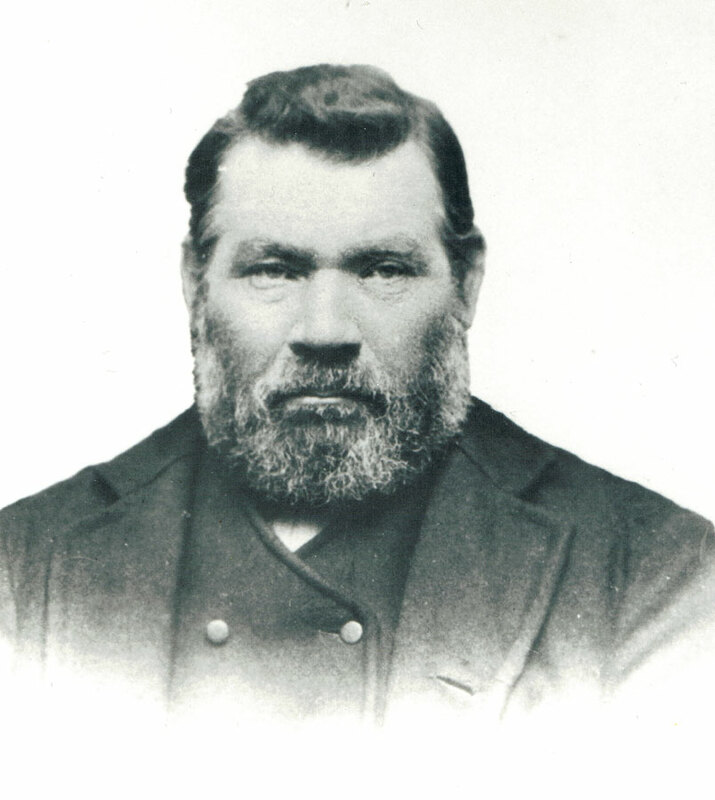 Her father, Peder Povlsen (1843-1928) grew up at Karby or Hvidbjerg on the island of Mors in the Limfjord. His parents were PovI Chr. 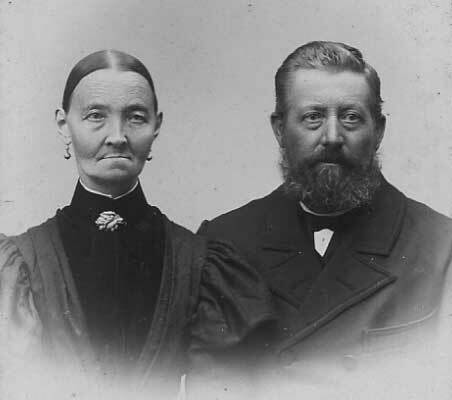 Pedersen and Maren Kirstine Christiansdatter. He was one of six boys, and since there were no girls in the family to help with the housework his mother had the boys sit in a row on the kitchen table while she taught them to knit. In his old age he spent some years in a home for senior citizens and there made use of that early acquired skill. As a young man P-Povlsen, as he was known, worked as a gardener on an estate or large farm belonging to the Sodborg family at Hørdum in Thy. There he won the heart of one of the daughters, Maren. The friendship did not meet with the approval of the Sodborg family as he was regarded as being beneath her station. When they were married her sister Signe was the only one of the Sodborgs to attend the wedding. Later however Maren’s brother Mads must have relented, for on one occasion when Mother and her sister Lydia were children they spent part of a summer vacation on the farm with the Sodborgs. The visit was cut short when Lydia became unhappy and demanded to be taken home. I have seen a picture of Grandmothers “Moster Signe”. Mother looked just like her in her youth. Maren’s father, Povl Jensen Sodborg, lost his life in 1849, in the 1848-50 war against Prussia. Mother remembered her grandfather Povlsen as an able workman who had a fine garden of his own, with vegetables, berries and fruit, and also looked after other peoples’ gardens. In the winter and in his old age he made slippers out of straw and sold them. He was generous, warm and friendly. He took great delight in presenting the Birkholms with a Christmas tree each year, and was a favourite with the grandchildren, often giving them oranges and bringing them “found” objects such as tennis balls. He was short and stocky. In his youth his beard and hair were uncharacteristically black. In old age they were white. The family wondered whether the Povlsens had Gypsy blood in their veins. Mother inherited his dark hair and brown eyes. Maren Sodborg Povlsen was an expert seamstress; people from the large farms would fetch her to spend a day or more with them sewing clothes. She made men’s suits by hand and did her sewing without patterns. One day her husband proudly presented her with a treadle sewing machine and the work became much easier. 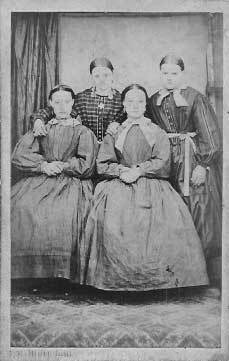 The Povlsens were early risers and like many others, went to bed at dusk in order not to waste kerosene. People of that generation often “kept darkness” in the early evening, i.e., sat and talked until it was completely dark before lighting the lamps. When my grandfather was courting his daughter Peder complained because Christian had kept Karen out until 8 p.m. P-Povlsen himself normally went to bed at 7. 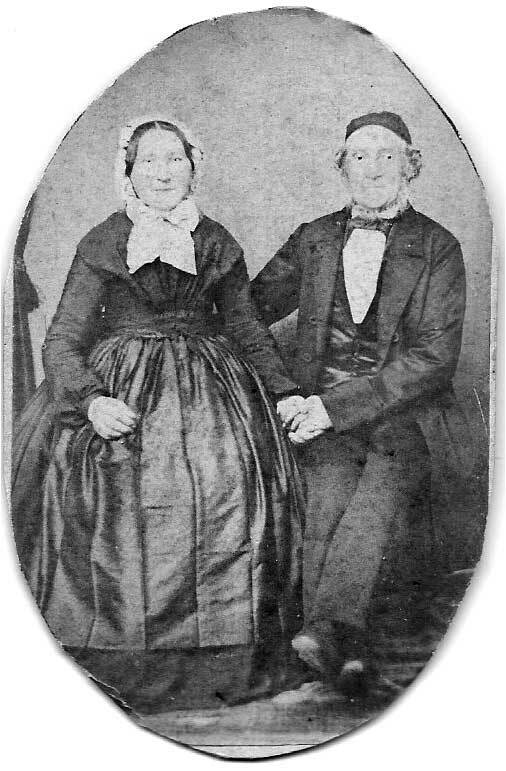 The Povlsens lived in or near Thisted throughout their married life. Maren was unwell in her old age, had difficulty with circulation and found it hard to keep warm. Peder was strong and able, and pampered her. He made her a footstool with a fleece covering to fit over her feet. 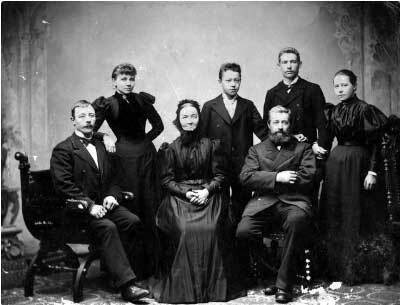 Maren and Peter Povlsen with their family. Karen is seated on the right with baby Peter, her husband behind her. In 1922 they had to face the necessity of moving into a home for senior citizens. Maren found the prospect threatening and demeaning. In the circles in which she had grown up the family took care of the older folk and there were servants to help; a home for seniors evoked images of a poorhouse. Plans were made for the move, but Maren died before it could take place. She never completely adjusted to the change in status which went with her marriage to an ordinary working man. Peder could more easily accept the move as he had grown up in humble circumstances. Peder and Maren had three children. Niels was a blacksmith by trade, but developed a heart problem and moved to Copenhagen where he worked as an insurance agent and as caretaker of an apartment building. He had four daughters and one son. The second child was my grandmother, Karen. The third, Martin, was a tailor who did his work in the old-fashioned way, sitting on a low table. He had a wide variety of interests, experimenting with electricity while it was still a novelty and collecting stamps for many years. He and his wife Tine lived in Thisted. They had no children.